The Blastolene boys build some of the most outrageously cool vehicle art around. This one designed by Michael Leeds and built by Randy is called the B-702. It is almost 20ft long with a 702ci V12 from GMC backed by an Allison 4 speed. The bodywork just flows and it looks like it's going 200km/h sitting still. Very cool. Check out the other pics and google it because the V12 sounds incredible and amazingly produces 650 lb.ft. of torque at a very low 850 rpm! A great example of beautiful motoring on a scale I like, big. 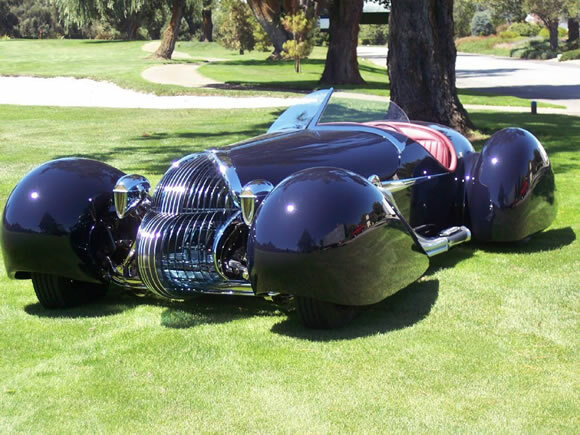 Check out the other Blastolene cars at Blastolene.com. Read the stories to. They are real car nuts. Excellent. View more pics of it here. P.S. See more beautiful motoring and join in on our Facebook page.